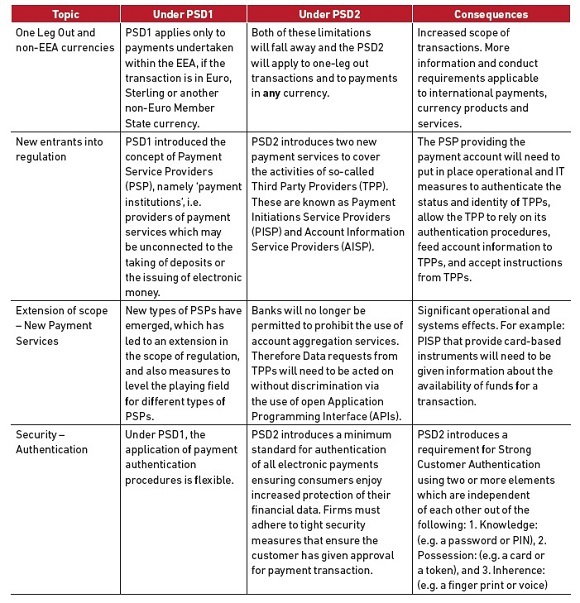 PSD2 will supersede PSD1 on 13 January 2018, retaining key benefits from PSD1 such as increased competition with facilitated market entrance for regulated non-bank players, improved economies of scale, enhanced transparency, but also incorporating technological innovation, enhancements and protection into law. This will ensure that a competitive playing field continues to develop, without exposing individuals, consumers or businesses to undue risks. In the UK, the FCA will have primary responsibility under PSD2 for monitoring compliance and enforcement, whilst the Payment Systems Regulator (PSR) will be responsible for legal provisions relating to access to payment services. The introduction of PSD2 requires financial institutions’ IT architectures to be open, pluggable and flexible. Financial institutions need to step away from closed legacy systems to more open standards and software. 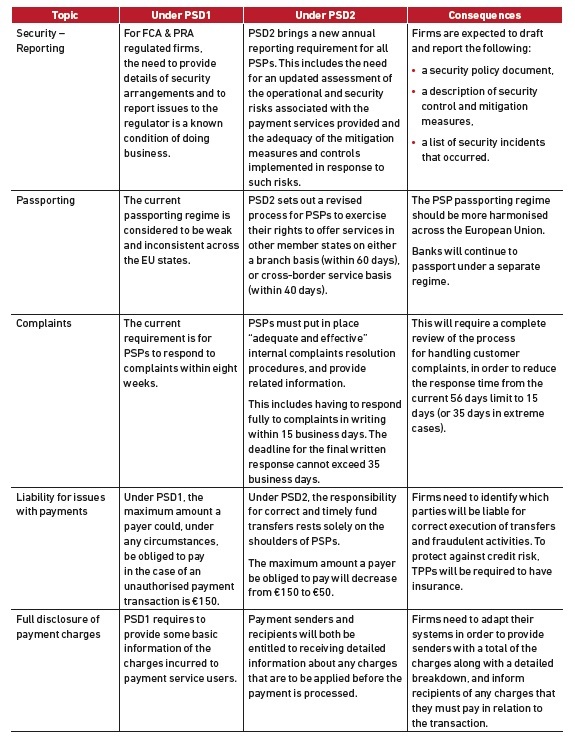 • Significant operational changes for all Payment Service Providers (PSPs). carry on providing payment services after this date, they must provide the FCA with required additional information before 13 April 2018.
transformation, leveraging the new opportunities introduced. Firms could for example consider setting up, or collaborating with, AISPs or PISPs. The introduction of PSD2 will incentivise firms to revisit their payment strategy and design partnerships with actors previously not considered within the payments industry (e.g. telecommunications). Firms should consider preparing an impact assessment on P&L to assess a potential threat to revenues. • resources, budgets and staff training requirements. PSD2 is a significant piece of legislation designed for the future to promote competition, increase customer protection, bring existing and new players such as Fintech firms, regulation and compliance and harmonise payment standards throughout the EEA. And for the avoidance of any doubt, Brexit does not stop the implementation of PSD2 in the UK.